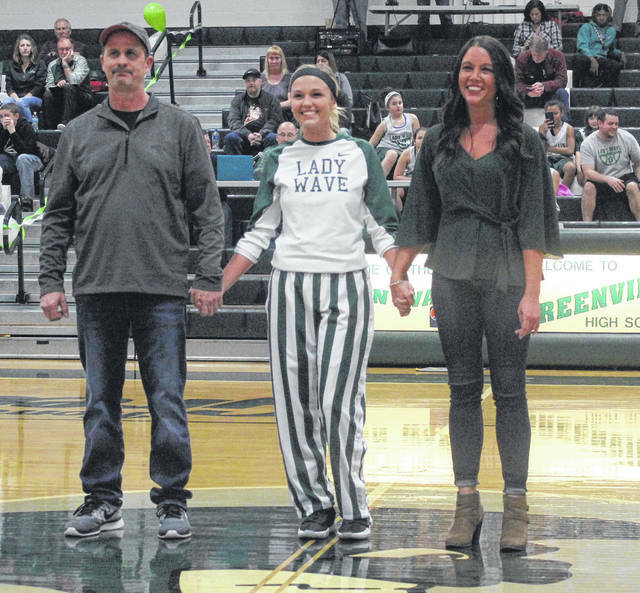 Greenville senior Jada Garland (center) is pictured with her parents Shannon Burns and Clyde Garland during a Senior Night celebration on Monday. Greenville senior Koryann Elliott (center) is pictured with her parents Mary and Rich Elliott during a Senior Night celebration on Monday. Greenville senior Lani Shilt (center) is pictured with her parents Amy and Jeff Shilt during a Senior Night celebration on Monday. 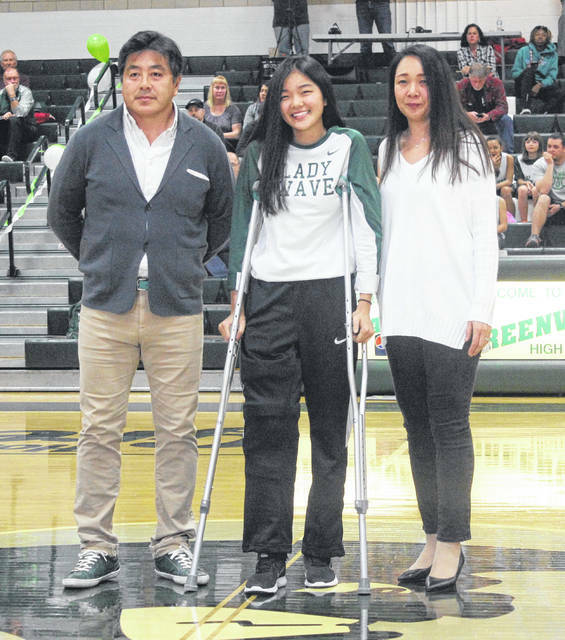 Greenville senior Saki Nakamura (center) is pictured with her parents Tomoo and Asako Nakamura during a Senior Night celebration on Monday. Greenville’s four seniors stood together to celebrate Senior Night on Monday. From left to right are Koryann Elliott, Lani Shilt, Jada Garland and Saki Nakamura. 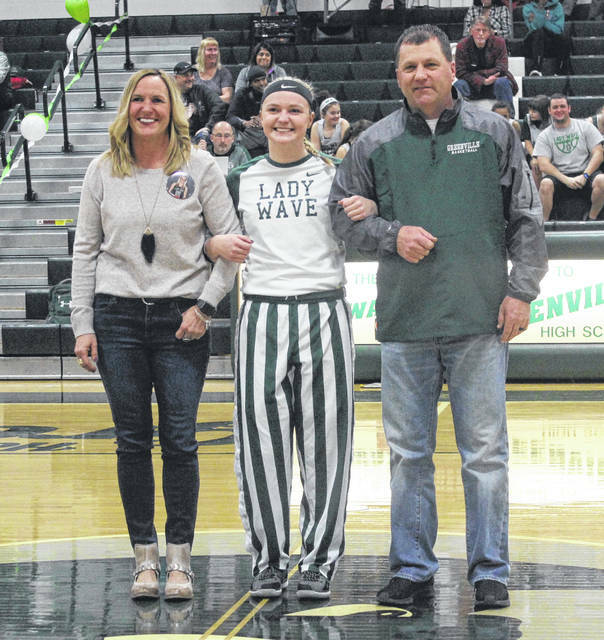 GREENVILLE – The Greenville Athletic Department recognized four Lady Wave basketball players and their parents prior to a home game against Bethel on Monday night for their dedication and support of the athletic program. The four seniors are Koryann Elliott, Jada Garland, Saki Nakamura and Lani Shilt. 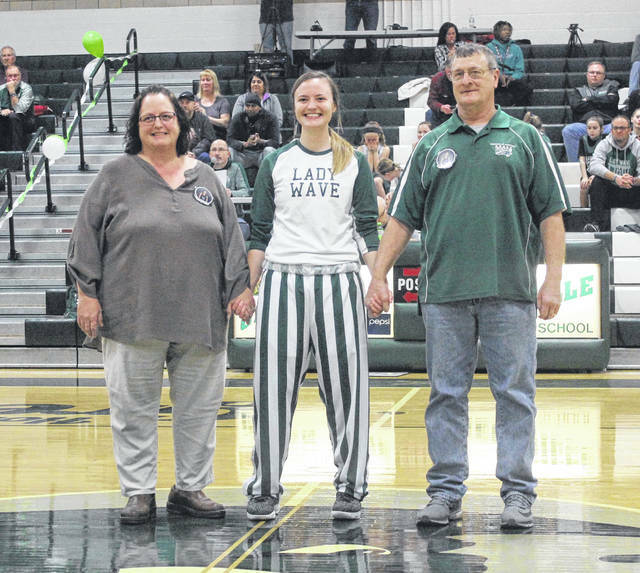 Koryann Elliott has been a member of the Lady Wave basketball program for four years. She also has been a member of Varsity G for four years, Medical Tech Prep for two years, National Technical Honor Society for one year, Science Club for four years and Environmental Club for four years. Koryann plans to attend a four-year university to obtain a degree in nursing. She is the daughter of Mary and Rich Elliott. Jada Garland has been a member of the Lady Wave basketball program for four years. She also has been a member of Student Council for four years and is currently Student Council president. Jada is also Senior Class secretary. She has been a member of Varsity G for four years, Art Club for four years, Science Club for four years, Environmental Club for four years, National Honor Society for two years and Student Athlete Council for two years. Jada plans to pursue a career in Fashion Merchandising. She is the daughter of Shannon Burns and Clyde Garland. 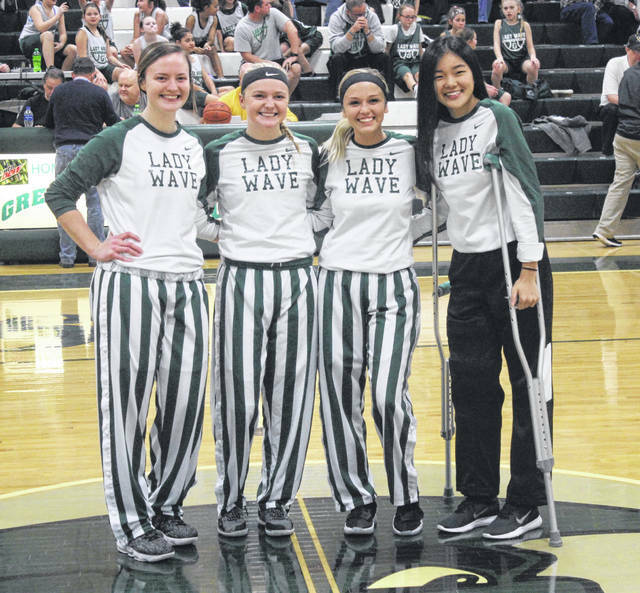 Saki Nakamura has been a member of the Lady Wave basketball program for four years. She also has been a member of Varsity G for four years, Science Club for four years, Student Athlete Council for three years, Art Club for three years and National Honor Society for two years. Saki will pursue a degree in art at the University of Cincinnati and plans to go on to be an interior designer. She is the daughter of Tomoo and Asako Nakamura. Lani Shilt has been a member of the Lady Wave basketball program for four years. She also has played softball for four years and ran Cross Country for one year. Lani is the Senior Class treasurer and has been a member of National Honor Society for two years, Art Club for four years, Science Club for four years, Varsity G for four years, Key Club for three years and Student Athlete Council for two years. She plans to attend a four-year university and study business and major in accounting. Lani is the daughter of Amy and Jeff Shilt.